Yesterday we talked about the potential end of peer-to-peer lending as we know it. And in some regards that’s true. But today I wanted to share with you an amazing new take on peer-to-peer lending: Mosaic. 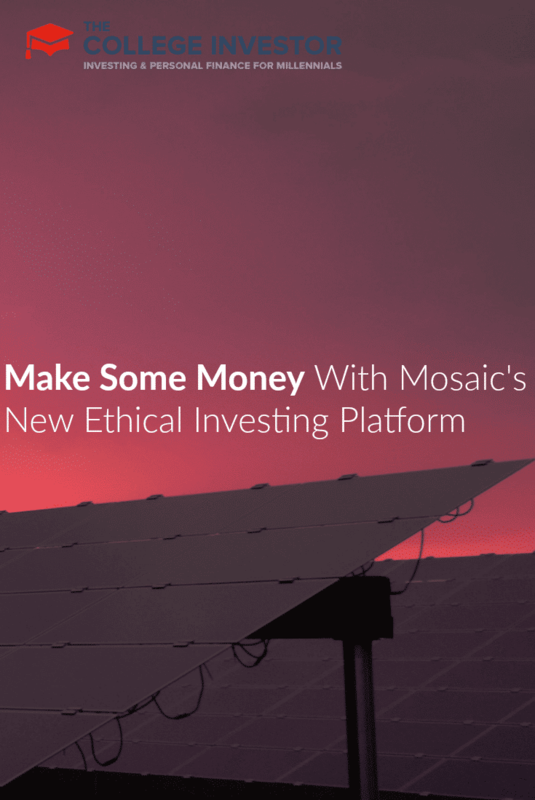 Mosaic is an online marketplace that connects investors to solar projects. These investments are structured as loans to build solar projects, and just like peer-to-peer lending on Prosper or LendingClub, you bid a certain amount, and when the loan is fully funded, it is paid to the project, which then pays you interest on your loan. Better yet, head to the bottom for a free gift from them for signing up — yes, free money! As alternative energy sources become more popular, more people will be turning to them. If you invest in solar projects early (like now), you’ll be able to reap the financial rewards and also know that you are protecting the environment. Even better, for every project, Mosaic includes detail of the impact of the project on their website. Sometimes being an ethical investor can be difficult. Some companies like Monsanto can make investors a bundle of money, but there is also the ethical issue to contend with. Are you making money at the expense of the environment and perhaps humankind? For some investors, this isn’t an issue. They simply invest to make money and grow wealth. If people are buying a product and there is a market for it, why is there any reason to feel bad? Other investors, though, wish that there was a way to successfully invest and uphold their own standards and philosophies. Mosaic is a way to do that by investing in real assets with lower volatility than traditional assets. You invest in a solar project. Currently only one is available, but in the next few weeks, several more will be available, also. For reference, the current solar project available is a 12,270 kW project for U.S. military housing in Fort Dix, New Jersey. The project is rated at AA− credit rating by Standard & Poor’s. The loan will be a total of $250,000 at a rate of one month LIBOR + 3.25%. Mosaic takes a 1% fee from the loan, so the investor return will be one month LIBOR + 2.25%. The loan term is 87 months. The solar project is then able to begin to make money by selling the energy to customers. Each month, you will receive a payment that includes interest on the money you invested as well as part of your initial principal. While the current project has a lower rate of return, past projects have yielded a 4.5% to 7% rate of return to investors. However, with more risk, you get more reward. Mosaic makes it easy to feel comfortable with your investment thanks to the company’s transparency. For instance, Mosaic charges a 1% annual platform fee. For every project available for investment, Mosaic clearly shows an expected yield after fees, which tells the investor, whether a novice or a beginner, how much they can expect to earn after paying their fees. Not many companies do this. In another bid for transparency, Mosaic gives a prospectus for each project so you can learn all of the important details about the investment. Finally, Mosaic’s platform is easy to use and straightforward. 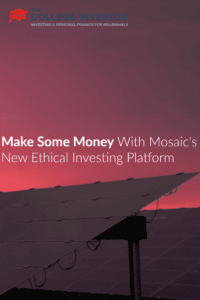 If you want to find an investment you can feel good about, investing in solar projects from Mosaic may be the way to go. You’ll earn a nice return, and you can help promote clean accessibility of energy. The key is to begin investing now, so you can reap all of the rewards for years to come. I wanted to let you know that Mosaic launched their “The Gift of Solar” campaign that runs through 12/24/13. They are giving away $25 to anyone that signs up for a free investment account at Mosaic and invests in a solar project (minimum investment is $25, so you’re literally getting a free investment on Mosaic). The Gift of Solar is a great exclusive benefit for The College Investor readers, and best of all, it doesn’t cost you a dime! Whether or not you want to invest any of your own money, I highly recommend you go check out this new innovative peer-to-peer lending solution and at least get your free $25 investment: check out Mosaic here. After you check it out, come back here and share your thoughts! Wow that is a great idea. I signed up but sadly they don’t have any projects I am eligible to invest in. I don’t meet the accredited investor status required by my state so I will just have to come back once I’m richer. That’s not fair – what state do you live in?